Co-located with Hannover Messe, a trade show for industrial print technology will be held for the first time from 8 to 10 April 2014: InPrint. Here more than 100 leading companies are presenting advanced printing equipment and manufacturing solutions for the decorative and functional printing sector. During the event, Bürkert along with the show’s coordinators will be conducting a survey on the success of the trade show as well as trends and topics of the industry. In this context Bürkert will present itself as a key sponsor of the “InPrint Industrial Print Research”. „We are taking part in the industry survey as well as the trade show in order to keep up with the latest trends as a worldwide leading provider of fluid control systems. Our core competences are customised system solutions based on more than 60 years of experience in the field of fluid technology. As a result we have been able to implement innovative system solutions with numerous renowned printing system manufacturers”, says Patrick Mohs, Product Manager Microfluidics. 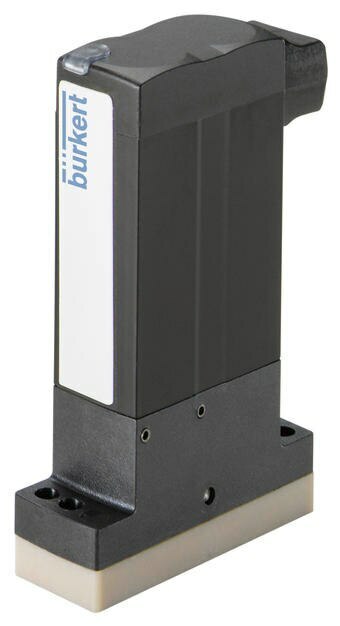 “Bürkert solenoid valves such as Type 6011 meet the special needs and requirements of the printing industry and have become established as standard valves due to their durability and maintenance-free qualities. More demanding applications are a perfect job for media-separated Type 0127. This valve convinces users with its high chemical resistance towards solvents and features functional reliability without ink residue”, explains Patrick Mohs. Over the past years a trend towards smaller sizes at equal fluidic performance has become apparent. As a particularly innovative solution Bürkert is presenting the TwinPower solenoid valve series at InPrint. Due to their compact design, these valves are suited especially for the needs of the printing industry. The technology is available as a complete standard valve programme in 10mm and 16mm width, hence allowing more than 1,000 possible variants per type series for flexible adaptation of the valves. Due to the wide range of industrial print products, flexibility takes on an important role in the design of industrial processes. Consequently, for example in addition to printed metal, plastic, textile or ceramics surfaces, imitations of wood grain are also possible. In all cases, end users expect both intense and full colours which do not fade and maintain their quality for as long as possible. These high requirements, combined with the generally increasing significance of individualised print applications, result in a rising complexity of the industrial production processes. In this context, one possibility for manufacturers are ink jet printers, which allow for integration into the processes without set-up times even under the most difficult conditions involving high air humidity or room temperature. Apart from different printers, machines and inks the exhibitors at InPrint are also presenting the latest methods for the integration of print processes for printing on any type of surface. The show focuses on the key technologies of inkjet, specialty, screen, digital and 3D print. It is targeted mainly at international print service providers and specialists from the entire printing supply chain, involving not only manufacturers but also industrial and commercial print companies. Visitors of InPrint can find Bürkert in Hall 21, Booth H05 as well as on our main booth in Hall 9, booth G16.